Lasting Standing Seam & Corrugated Metal Roofing Designed to outlast the majority of available roofing systems, metal roofing has become the roof system of choice in the northeast due to its durability, fire resistant, and performance during the New England winters. Metal roofing has that luxury benefit of its ability to shed snow, which normally would be retained on the roof by an asphalt or wood shingle roof system. Metal roofing from Team Vinyl and Roofing Co. will keep your family safe and secure for years to come. Plus, it’s sleek look and the different design options, make it a great fit for a variety of housing types and styles. Standing seam metal roofing can be installed on simple or complex roofs. It has crisp lines and unbroken panels from ridge to eave, double-locked seams and concealed fasteners to ensure maximum weather tightness and can be installed on a minimal pitched roof. 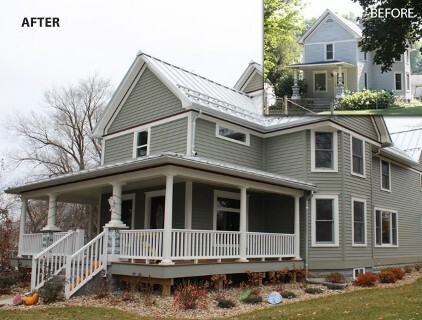 Standing seam metal roofing panels are formed with a roll former. They can be shop fabricated, but more often it is done right on the job site. Team Vinyl and Roofing Co. is proud to have partnered with Drexel Metals™ standing seam roofing. By its very nature, Drexel metal is impenetrable to the elements, lasts a very long time, and reflects most of the sunlight off of your roof rather than heating up and absorbing it into your building. This leaves you with lighter energy bills, and who doesn't want that? Our ultimate goal can be summed up with one phrase: Peace of mind for the architect, and to assure our customers that our Drexel metal roofing systems and products will meet your requirements each and every time. That's what we strive for, and that's what we accomplish. Corrugated ribbed metal roofing has been an excellent choice for commercial, agricultural, industrial buildings and now has become a very popular choice for residential homes. The symmetrical pattern creates an attractive look, superior strength, and is heat formed with a weather-tight side lap. A stiffener is added to all major ribs, which along with the superior thickness of the steel makes this panel extremely strong... This not only adds considerable durability to your building but also prevents rippling during the construction process. Team Vinyl and Roofing Co. is proud to have partnered with Everlast Metal roofing, featuring the safest and highest quality protective coating systems to ensure that your roof remains pristine, holds its color, and is free of corrosion for generations to come. Corrugated ribbed roofing is an exposed fastened roofing system that is less costly than standing-seam metal roofing and also available in a wide variety of colors. To ensure trouble-free longevity, contact our 5-star experienced and skilled contractors. If you’re in the market for new metal roofing, make Team Vinyl and Roofing Co your first call! After more than three decades in the home improvement industry, we have been able to help thousands of happy homeowners throughout New Hampshire and Vermont with all of their roofing and home remodeling needs. If you recognized even one of the above roofing issues, now is a great time to consider a new metal roof – or if you prefer a more traditional asphalt shingle roofing – from Team Vinyl and Roofing Co. We are committed to providing only the very best replacement roof products and with our award winning services; you can rest assured your new roof can be enjoyed for many years to come. 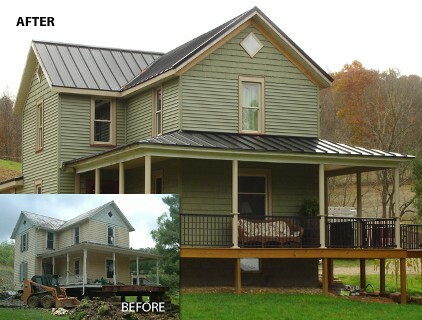 Call Today For Your Metal Roofing Estimate! Don’t wait - call Team Vinyl and Roofing Co. (603) 336-3393 today to get started on your next New Hampshire or Vermont roofing project! You can speak to one of our friendly, knowledgeable representatives to learn more about our industry leading warranties or fill out our quick online form to schedule your FREE, no-obligation estimate. We are proudly located at the same Hinsdale, NH address for over 30 plus years.